n January 1, 1868 Dr. Manuel Bilbao did something that can be regarded as a breakthrough for journalism. Up to that time newspapers were sent to their subscribers by mail, or they were bought at the printer’s shop itself. 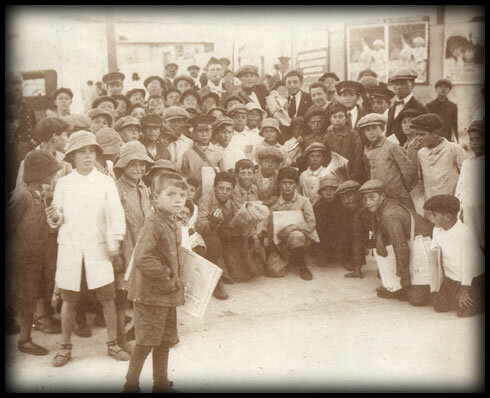 But when the paper La República appeared for the first time, founded by Bilbao himself along with Alejandro Bernheim, citizens were surprised by hearing for the first time in downtown streets the voices of some boys crying out: «La República at one peso!». But not only the street newspaper vendor appeared but also the shock of an important discount. It meant a great success and soon was imitated by his colleagues. The innovation crossed the borders and it even reached France. Gradually permanent street stands were installed and soon the number of boys agile and strong to run along the streets a race against time came to spread as soon as possible the impact of news, many times exaggerated or half made-up. The boys found their task restrained by the abundant presence of kids; it was a time of misery, of an alarming lack of jobs, so the kids brought the possibility to get some more cents for their income to many families. Furthermore they were sought after because they were faster and more daring than the older ones. They swiftly got up and got off streetcars —their preferred vehicle—, they left one and immediately caught another, without caring for its direction and making exclusive use of their intuition for sale. A new character had appeared in the landscape of the city of Buenos Aires and quickly the same happened in the cities of the interior of the country. But the street newsboy had not still the name that distinguished him in a special way. We had to wait until 1904 for that. The word canilla derives from the Latin word canella that is the diminutive of canna, cane in Spanish. The dictionary defines the term: «the long bone of legs and arms». On January 17th, 1875 Florencio Sánchez was born in Montevideo. Since he was 16 he devoted to journalism working for different Uruguayan media and when he was still very young he decided that his future was in theater, he dreamed of becoming a playwright. He arrived for the first time in Buenos Aires in 1892. In La Plata he worked as clerk in an office where the boss was Juan Vucetich (1858-1925), a famous police official and inventor of the fingerprint system. His first works were written in this city. In 1902 he traveled to Rosario, province of Santa Fe, to work as editor-in-chief in the newspaper La República founded by Lisandro de la Torre. The world of journalism inspired him and he wrote a theater play, a small one-act play with three scenes. The main character is a boy who sells newspapers. He was looking for a title, but he was touched by one of the Rosario boys with extremely thin legs. Spontaneously the word canillita sprang up and so he named his play. A Spanish theater company devoted to zarzuelas, the one led by Enrique Lloret, agreed to stage it. It was premiered on October 1, 1902. The main role was carried out by the tiple (soprano or treble voice) of the group, a certain Mrs. Iñíguez, according to what is written in the program that detailed the cast. Tiple is the highest human voice, typical of women and children. The play was staged to great acclaim, to such an extent that it was performed for twelve consecutive nights. By that time, Florencio was in need of money, he lived nearly in misery. Furthermore he longed for marrying his one and only fiancée, who finally became his wife. In 1903, he met the actor and impresario Jerónimo Podestá who premiered his title: M’hijo el Dotor to great acclaim. Due to this he dared to suggest the company staging his one-act play Canillita in Buenos Aires. By that time there were no children acting at plays, instead young women that possessed that ability played the part of kids. The chosen one was who would be later the famous actress Blanca Podestá. The repercussion of Canillita was beyond the expectations. Critics wrote praising the play. The newsboys fully identified themselves with the name. Then, of common accord with the artists, a performance with free admission for all the newspaper vendors was organized. The event took place at the Teatro Comedia, the one located on Carlos Pellegrini Street, between Cangallo and Cuyo (now Presidente Perón and Sarmiento). The appointment was on a Sunday at 2:30 pm. The attendance exceeded the capacity of the room and noisily celebrated the simple lines of the pieces that were sung and they even tried to take part in the play when the police arrested the canillita. They did not see the difference between fiction and reality yet, like in the old days happened with the play Juan Moreira. Florencio had tuberculosis, and as he had saved some money he traveled to Europe. But just like in tango, his ill body did not resist any longer. He was taken to the Fate bene Fratelli hospital of Milano where he died on November 7, 1910. 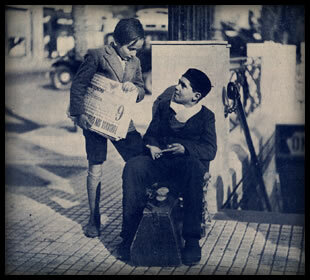 Years later that day was consecrated as el día del canillita (The Newsboy Day) as homage to our dear Florencio Sánchez. In 1957 in the readers' letters section published in the newspaper La Nación, a Uruguayan gentleman, old distributor of papers, regarded himself as the creator of the term. He recalled in the letter, that at the turn of the nineteenth century he had a vendor kid, son of a woman called María Canilla. On one occasion that he had to call him from a certain distance and as he did not know his name, he shouted «Canillita!». Later the term was applied for all newspaper vendors. A couple of articles published some years before chronicle the life of María E. de Ísola, known at her time as La China María. She died in 1934 at age 82. He was regarded as the first woman who sold newspapers, always near or based at the corner of Rivadavia and 25 de Mayo. Movies were as well concerned with this issue. 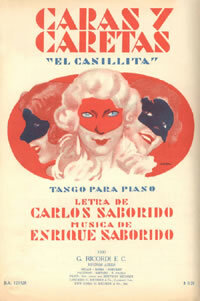 On June 26, 1936 the film Canillita was premiered, with the actors Gregorio Cicarelli, Benita Puértolas (mother of the remembered TV conductor Héctor Coire), Lopecito and the singers Amanda Ledesma and Príncipe Azul. The Pedro Maffia Orchestra played a tango with the same name composed by Julio César Sanders and Daniel López Barreto, with lyrics by César Felipe Vedani. On June 8, 1938 the movie El canillita y la dama was premiered, with Luis Sandrini and Rosita Moreno, directed by Luis César Amadori. Tango, as it was quite likely, gave birth to many pieces about this subject and with the same title. 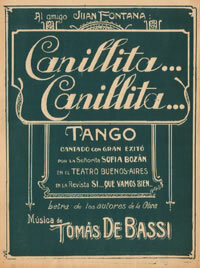 Besides the above-mentioned, there are other tangos with that title: “Canillita [c]” composed by Carlos Pibernat, recorded by Julio De Caro on October 22, 1925; another by Francisco Canaro, who firstly recorded it with his orchestra on March 31, 1936 and later with his Quinteto Pirincho on December 19, 1956. The Cuarteto del Centenario recorded it as well in 1978. There are, besides, four written pieces that were hardly committed to record: “Canillita [b]” by Osmán Pérez Freire with lyrics by Antonio Viergol, “Canillita [d]” by Vicente Mazzocco, other composed by Alfonso Gallardo and lastly another by H. Toto. As well the brothers Enrique and Carlos Saborido published a piece titled “Caras y caretas (El canillita)”. 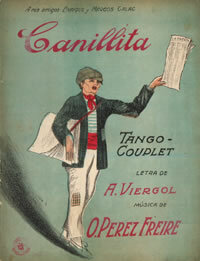 Another tango “Canillita canillita”, even though in some discographies appears as “Canillita”, was composed by Tomás De Bassi and Antonio Botta. It was recorded on December 29, 1925 by Agustín Magaldi, that same year was also recorded by the Osvaldo Fresedo orchestra and in 1928 by Sofía Bozán with the orchestra led by Francisco Pracánico. 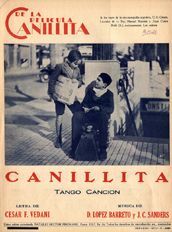 Besides other titles concerning this subject, we end this note mentioning the true homage meant by the tango “Para vos canilla” written by Horacio Quintana and Julio Martín. It was recorded by Rubén Juárez with the Carlos García orchestra, in his first record in 1969 and, later, reprised by Hugo Del Carril with the orchestra led by Armando Pontier on July 7, 1971.